Products, information, and a gift card have been provided by Krusteaz for this post. All opinions are as always, 100% my own. We are big fans of family dinner nights. They don’t always happen or work out the way I want but we still keep trying. For dinner we are big fans of Krusteaz products. They make an amazing flat bread mix that we use for homemade pizzas all the time. So when I was contacted about doing Breakfast for dinner, I was all in. 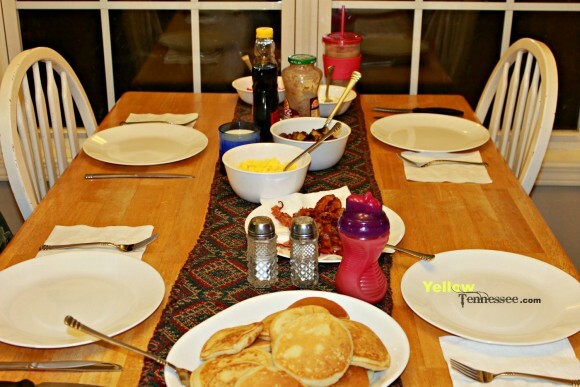 In a recent survey Krusteaz found that 90% of all American’s enjoy breakfast for dinner. More than that 30% of respondents reported to having Breakfast for dinner at least once a week. So we had some breakfast for dinner. Complete with bacon, eggs, potatoes, and some amazing Strawberry Cheesecake Pancakes. Start off with some Krusteaz pancake mix and make up your pancakes. 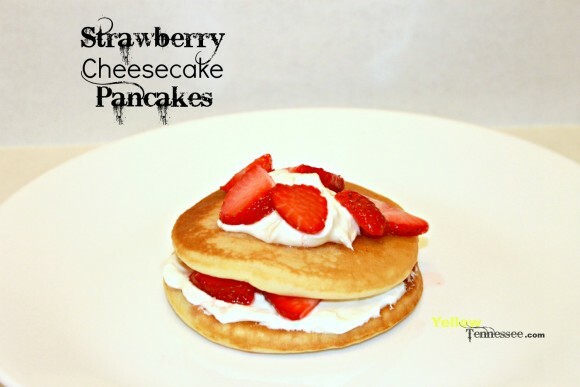 Slice strawberries and layer with the cream cheese mixture and pancakes. I hope that this recipe serves as your next inspiration for breakfast for dinner. And make sure to check out the Krusteaz site for more great products, ideas and recipes.